Lane’s prolific career spanned almost seven decades and he was one of the first to join the Screen Actors Guild in 1933. Though audiences probably wouldn’t recognize his name, they surely remember his face and trademark crusty demeanor and a list of over 800 credits. 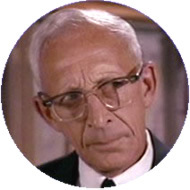 Lane was a regular on Petticoat Junction as mean-spirited railroad vice-president J. Homer Bedloe. He appeared on six episodes of Dennis the Menace (as Mr. Finch), seven episodes of Soap (as Judge Petrillo in Jessica Tate’s trial), and eight episodes of Bewitched in multiple roles. He can also be seen on episodes of classic series like Get Smart, The Andy Griffith Show, The Odd Couple, Little House on the Prairie, Dark Shadows, L.A. Law, and Maude, just to name a few. He also appeared on seven episodes of The Beverly Hillbillies and took part in the The Return of the Beverly Hillbillies reunion movie. Lane was honored on the occasion of his 100th birthday on the 2005 TV Land Awards. A special award was presented to him by young star Haley Joel Osment. Lane made a point of telling the audience that he was still available for work. You can see the clip below. Lane was married to Ruth Covell for 70 years, until her death in 2002. A documentary about his career and life, entitled You Know the Face, is currently in production. Stay tuned!